Cacao Ceremonies are healing, fun and good for you. Bring magic and healing to your heart and your life with a sacred cacao ceremony. Harness the natural healing powers of Cacao boosted by the May full moon energy. Make way for joy and love to come into your life. Relax, quiet the mind, connect with yourself. Fill your heart with bliss. For centuries our ancestors have come together to celebrate and recharge with the magic of nature, bringing about deep connection and grounding within and between people. This is a great way to let go of the past, feel present and manifest a brilliant future. Take this opportunity to quiet the brain chatter and have some time just for you. Take the time to deeply relax and allow positive transformation to take take place on a deep level. Cacao was the food of the Gods for a reason. Bursting with healing properties and health benefits, cacao taken in a group setting can bring about the shift you need to take you to your next level. Heal your heart with ceremonial grade, hand harvested, raw, organic chocolate. Allow me to take you on a journey into your heart, soul and the collective consciousness where you can heal pain and find your own power. Banish limiting beliefs and embrace your truest, best self and innate gifts. Nancy is a therapist with extensive knowledge of working with Cacao and classical Shamanic traditions. 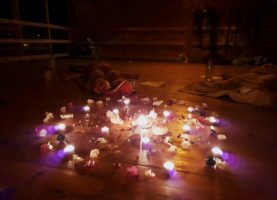 She will take you on a meditative journey with Cacao where you can settle into a ‘blissed out’ feeling, ready to manifest wonderful things in your life. Bring a mug and wear something comfortable.